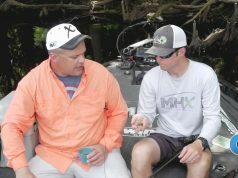 Most bass fishermen already know that working a plastic worm around structure is a highly productive technique, and ripping a worm around pads is no exception. In this article we talk about using the Speed Worm in late spring, and how to rig it and fish it. 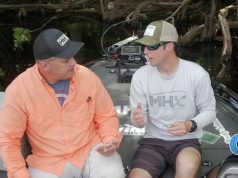 Some of the most effective techniques for catching bass involve working soft plastics around structure, and down here in Florida come late spring it is about working top water and working soft plastics. There is one bait in particular that actually marries both disciplines very well. The Speed Worm! We like to start by throwing a regular size and mag size Speed Worm to see which works best, and then focus on the most productive size. Typically, here in Florida, the most productive pattern is working the Speed Worm around lily pads, as well as some cypress trees. We try to fish a little bit faster down south this time of year, because in late spring fish are active and water temps are on the rise. Out standard setup is 50 lb. braided line with a little tungsten 1/8th oz. peg sinker and a good size worm hook, like a 4/0 Owner hook. We are just buzzing the middle and outside edges of pads. A lot of the guys call it a speed worm, a speed vibe, or even a vibe tail. Basically, the tail has a cut in it, so when you are rigging it, rig the cut down so the tail is going to walk on the surface back and forth. You can also wake it, running it just below the surface so it creates a wake, or you can run it on top where it’s actually spitting water and causing a disturbance on the surface. Bass this time of year like to hunker down on the outside edges of these pads so when it comes across, they just blow up on it. Nice thing is you don’t have to retie if you want to fish it slow. If you see a nice piece of wood, you can fish it like a Texas rig. In other words, you can be buzzing it and the very next second you can kill it and let it fall letting the tail do its thing, and pay attention to your line on the fall because that is when you will usually get the bite. For the fishing rod, we prefer a faster tip. 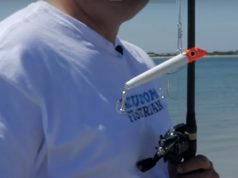 We build our own fishing rods, and today (and in the video) we used an MHX MB874, which is a fast action 4 power rod, and we primarily use MHX WinnDry grips too. They are awesome is you have not tried them before! This rod is designed to throw 5/16 oz. to 1 oz. lures. Like we mentioned, we prefer to use a 50 lb. braid, because we don’t really want to play around with the fish. If the fish start to get a little spooky, we may throw it on 20 lb. fluorocarbon. So next time you find yourself on the water on looking to add a new top water technique, give the Speed Worm a try. You can run it on top, and even stop to jig some logs – without the need to change rigs. Very versatile! Learn how easy it is to build your own bass fishing rod. Check out the MHX-MB874 and all the Mag Taper bass blanks today at MudHole Custom Tackle!